Picking and eating fresh fruit can be a fun and energizing traditional activity. However, without much effort you can elevate your fruit consumption to another level! 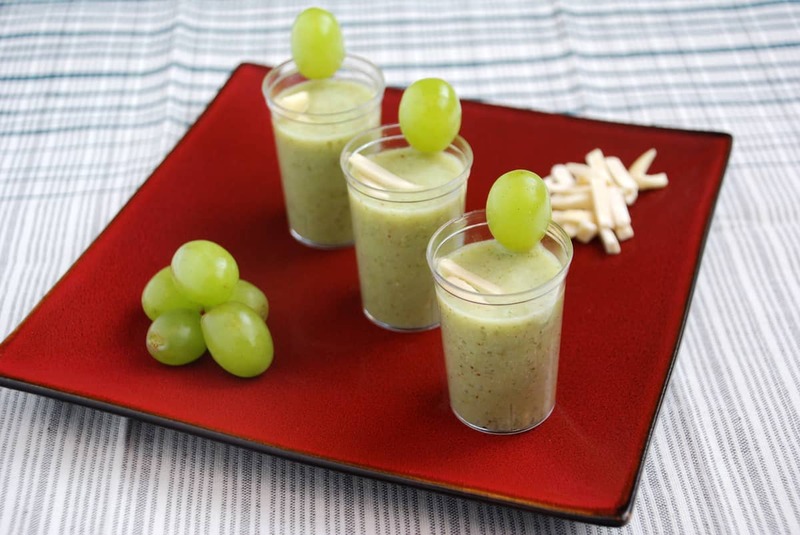 To liven up any party consider turning fruit into a delicious rich soup or gazpacho. Use a modernist technique and turn the soup into funky spheres. Another great way to amaze your friends is to add surprising texture to food by forming gel cubes; it's simple with the addition of a modernist ingredient such as agar. By using a whipping siphon, you can make a fruit foam dessert or a cocktail topper. Infusions are another interesting alternative to do with fruit. You can infuse any liquid such as alcohol, vinegar, oil or water with fruit, or infuse a fruit (or other food) with flavoring agents. An infusion can be achieved through a slower traditional method, or faster with a whipping siphon or a sous vide process. The options of dressing up fruit are endless and only limited by your imagination. The following are our top recipes and articles for making interesting and unique fruit dishes and treats! Heating peaches with sous vide softens them up slightly, resulting in a tender snack. Adding some bourbon and cinnamon to the bag infuses them with rich flavor, which some chopped almonds, molasses and fresh mint rounds out. Fruit compotes, jams, and marmalades are real easy to make with sous vide. Simply put some fruit, with any pits or inedible skin removed, into a bag with some sugar and acid then cook it up to an hour or two and you are good to go. In this recipe the pressure cooking of the plantains caramelizes them, ratcheting up the sweetness and adding more depth of flavor. Then simply puree them with dark rum and place them on crostini for a great snack! Lemon confit, or preserved lemon, is a popular ingredient in Moroccan cuisines and is great for adding a little brightness to a dish. It traditionally takes several months, but using a sous vide machine speeds up the process to about an hour! This is a great meal anytime and pairs the sous vided moist and tender turkey with a sweet and sour cranberry chutney. Always a family favorite! For this recipe I roast the strawberries then puree them to form a sweet and tangy salad dressing. For a different flavor combination I serve it over a savory pulled pork and arugula salad. This apple chutney is a very flavorful topping that provides a savory punch to pork, fish or even on a dessert! This recipe sous vides the apples in a bourbon, maple syrup, chipotle and thyme mixture. For a PB and J dessert worthy of a party, I make a home-made cashew butter to replace the peanut butter and then turn some fresh raspberries into a flavorful fluid gel for the jelly. I serve it with a sliver of dark chocolate for richness and a lemon twist to add brightness. When served open face it better highlights the flavors. I really like how the halibut goes with the sweet and tart citrus pudding. This is a simple dish but one that is full of subtle flavors. The orange and lemon help complement the halibut and the basil adds just a hint of spice to it. For these fun and flavorful party desserts I make a gelled ravioli from bananas and cream and fill them with Nutella. Just top them off with some shaved chocolate and mint leaves or serve them with ice cream - either way it is a crowd pleaser! The combination of apples and pork are a classic pairing in Irish cooking. For this recipe, I roast apples and use the modernist ingredient of agar to turn them into a fun pudding topper for pork. By sous vide cooking the pork, you can consistently serve an extra moist and tender meat entree. This family favorite summer recipe tops a flavorful, tender sous vided hanger steak with fresh peach salsa. When using sous vide, a convenient hands-off cooking method to prepare this underutilized cut of meat, you have even more time for relaxation. The salsa is simple to prepare and really highlights the flavor of the peaches while still complementing the steak. Banana chips are easy to make and taste so much better than the store brands. This recipe uses a standard dehydrator to make these great garnishes for desserts or as a base for crostini-like dishes. The cinnamon gives these banana chips some additional heat and flavor - Yum! When cooking sous vide beets it tenderizes them without turning them mushy and this recipes combines them in a walnut and blue cheese salad with Mandarin oranges. This pulled pork recipe takes a tropical turn with pineapples, chiles, cilantro, and lime juice. This versatile dish can be served as an appetizer or main dish and either hot or cold. While the most common and well-known use of a whipping siphon is to create foams you can also use it to infuse liquids and to carbonate liquids. In this modernist recipe, I carbonate the water in watermelon to make a fizzy salad. It's a unique way to present an easy summer dish. Summer isn't exactly apple season, but at both farmer's markets and grocery stores many varieties are available year-round. Here in Central California we've had quite a bit of cool weather from late May through June and into July. For me, cool weather means comfort food, and baked apples fall right into that category. For this sous vide recipe I decided to use country style ribs and paired them with sweet apples and an orzo salad. The ribs come out super tender but still nice and moist and the apples add a great hit of sweetness to them.